Distribution of the MW dwarf satellites in Galactocentric coordinates. The position of Ant 2 is shown as a red filled circle. The positions of the Magellanic clouds are shown in blue. Other MW dwarf galaxies are shown in black. Image credit: Torrealba et al., 2018. Using data from ESA's Gaia spacecraft, astronomers have discovered a new Milky Way satellite in the constellation Antlia. The newly found dwarf galaxy, named Antlia 2, is several times larger when compared to other systems of similar luminosity. The finding is detailed in a paper published November 9 on arXiv.org. The Milky Way is known to be orbited by dozens of smaller, gravitationally bound galaxies. Although the list of identified satellites is relatively long, astronomers believe that some are still undetected. With the aim of expanding the list of the Milky Way's satellites, a team of astronomers led by Gabriel Torrealba of Academia Sinica in Taipei, Taiwan, has conducted a search for new satellites, especially dwarf galaxies. For their study, the researchers used a combination of astrometry, photometry and variability data provided by Gaia Data Release 2 (DR2). The search resulted in the finding of an enormous, faint dwarf galaxy orbiting the Milky Way, which has received the designation Antlia 2 (or Ant 2 for short). Its nature was confirmed by spectroscopic observations with the 2dF+AAOmega Spectrograph on the 3.9 m Anglo-Australian Telescope and archival DECam imaging. The astronomers refer to the newly found satellite as "the hidden giant," given that the galaxy turned out to be significantly much larger than other systems in the Local Group with similar luminosity. "In this paper, we use Gaia Data Release 2 (GDR2, Gaia Collaboration et al. 2018b) to discover and analyze a new dwarf satellite galaxy orbiting the Milky Way. 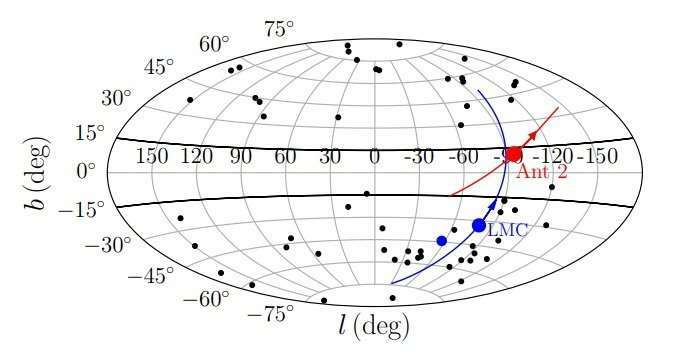 The discovery was made at the Flatiron Gaia Sprint 2018," the researchers wrote in the paper. Ant 2 is located some 424,000 light years away from the Earth and is estimated to be about 11.2 billion years old. The galaxy has an angular half-light radius of approximately 9,300 light years and a magnitude of –8.5 mag. The astronomers note that these values make Ant 2 similar in extent to the Large Magellanic Cloud (LMC), but with a luminosity around 4,000 times fainter. They noted that when compared to systems of similar luminosity, Ant 2 is several times larger, while for objects of comparable size, it is about three orders of magnitude fainter. The researchers also report that Ant 2 is the most diffuse object detected to date, about 100 times more diffuse than the so-called ultra diffuse galaxies (UDGs). Moreover, UDGs with sizes similar to Ant 2 are typically about six mag brighter. In concluding remarks, the authors of the paper emphasized the unusual properties of Ant 2, which may prove that dwarf galaxy formation can proceed at surface brightness and density levels significantly lower than those so far observed. "Ant 2 could be the tip of an iceberg—a population of extremely diffuse galactic dwarf galaxies even fainter than the numerous satellites detected in wide-area photometric surveys over the past two decades. Fortunately, Gaia data – as illustrated by this work – may be the key to testing this hypothesis," the researchers concluded. More information: G. Torrealba et al. The hidden giant: discovery of an enormous Galactic dwarf satellite in Gaia DR2, arXiv:1811.04082 [astro-ph.GA]. I speculate that many of these satellite dwarf galaxies will, eventually, be proven to have originated in what I would call Primeval Predecessor Galaxy. Which began forming very soon after the BB event. During this antediluvian stage, the earliest stars were hydrogen and helium. The larger examples cooked off & blew up. Gravitational shockwaves collected the resulting clouds of fumes & debris into what in turn brewed up collectives of stars. This cycle continued for billions of years. Our Milky Way is the resultant winner of that free-for-all. "For every action, there is an equal & opposite reaction. All the primitive dwarf galaxies we see today are the rejects & leftovers from the process. Eventually, as the Milky Way & Andromeda collide. All those outliers will be pilled in and consumed by the conglomerate. Looking at the Andromeda galaxy, we don't see companion dwarf galaxies. How come? But also remember, dwarf galaxies are faint, and at the distance of Andromeda some will be very hard to detect. They are simply too faint. There could be dwarf galaxies across entire "free" space for all we know. Just too faint to "see". Their follow-up paper is probably going to be about extremely tiny giants. discoveries like this to me are not so unexpected and i still believe one way or another will effect significantly the assumptions and final outcome about 'dark matter'. its very possible massive clumps of matter exist at the distant ends of the universe that are so red shifted we cannot see half the universe's matter. i still believe one way or another will effect significantly the assumptions and final outcome about 'dark matter'. And FWIW, we have been guaranteed for years now they will not [ http://www.scienc...s-cosmic ]. There's only one other this big and it's obvious in the Southern Hemisphere, which you have presumably never visited. It's called the "Large Magellanic Cloud." Maybe you've heard of it. We only missed it this long because it's behind the galactic disk and quite faint. And both the LMC and this new dwarf galaxy are orders of magnitude smaller than the Milky Way, therefore it's a dwarf galaxy.